The advantage of three-phase feeding is that the produced solar capacity is always symmetrically distributed on all three power conductors to the public power grid. 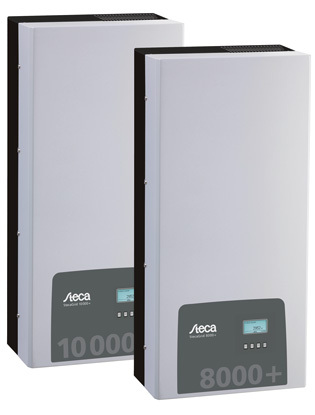 This is the case across the whole output range offered by these inverters. When designing a system, the laborious avoidance of an asymmetry of more than 4.6 kW through the appropriate selection of separate inverters is thus dispensed with. Symmetrical feeding is greatly in the interests of energy supply companies. Lengthy discussions with such companies are therefore a thing of the past. While the voltage passes through zero on the grid-feeding phase, single-phase inverters must temporarily accommodate all energy supplied by the solar modules within the device. This is usually realised by electrolytic capacitors. These components influence the service life of an electronic device, due to the possibility of drying out. With three-phase inverters, energy is fed into the grid on at least two phases at all times. Thus, the necessity of intermediate storage of energy in the device is greatly reduced, which is of benefit to the system operator with regard to a longer service life.